Anniversary date: Use this option to send emails on, before or after a specific anniversary date. This is a great way to create an effective Happy Anniversary message to your subscribers. Link clicked in a campaign: Use this option to send emails on or after the moment when a subscriber clicks a link within the body of a campaign. Campaign last click: Use this option to send an email on or after the last click of a subscriber. Campaign open: Use this option to send emails when the subscriber opens an email campaign. Specific clicked link in a campaign: Use this option to send emails on or after the time when a subscriber clicks on a specific link within the campaign. 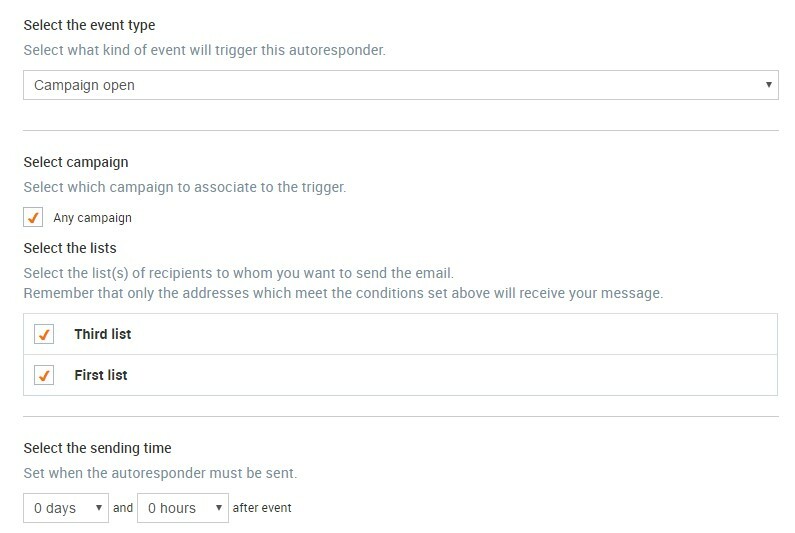 If you choose this option, you will need to specify the campaign name and the link that will trigger the autoresponder. Subscription: This is the most popular option, used to send emails on or after new users subscribe to a specific list.